Hang on or get thrown off! Now you can be the rodeo king......or are you the rodeo clown? LOL! 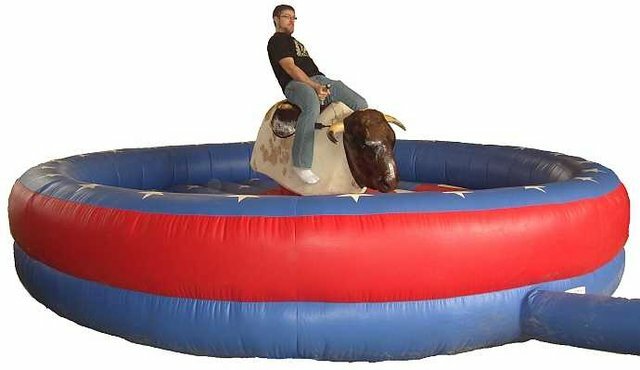 Mechanical Bull, mechanical bulls, mechanical rodeo bulls, mechanical bull riding and bucking bull machines for rent. Mechanical Bull rentals in northern california. Call to rent a mechanical bull for your next event! Prime Time Interactive operates the safest and most realistic mechanical bull rentals available in california for rodeos, college parties, corporate events, schools, private parties, rodeos, cowboy western events, rock and country music concerts, fairs, company promotions, or any special event. Renting a rodeo mechanical bull is loads of fun! Completely safe for both children and adults, this all-electric (no hydraulics), direct drive, computer controlled attraction is as safe as it gets. Mechanical bucking bull machines that are perfect for the youngest rider to an experienced cowboy. We can slow the machine down so that youngsters can get on for a ride and with a turn of the control knob, bring the speed up to challenge even the most seasoned rider. How much is a mechanical bull rental? Give us the opportunity to get you a quote.